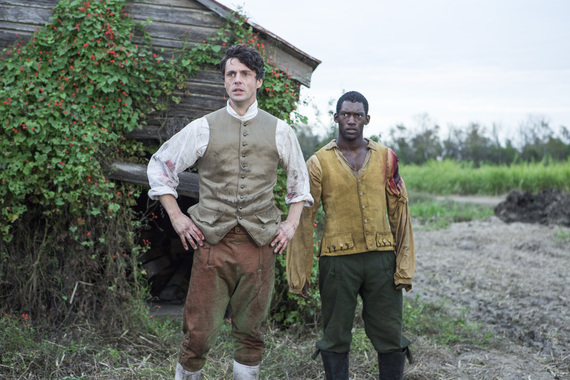 Watching the new Roots, which would be one of the best TV things you could do this week, you're reminded that in at least one important sense, it's about a bigger matter than even slavery. It's about the most timeless part of human nature, which is how we behave toward other people. In this case, widespread acceptance of an abhorrent institution becomes the trigger for much of that behavior. The new Roots, a four-part, eight-hour series that airs Monday-Thursday at 9 p.m. ET on History, wisely follows the lead of the original 1977 production by making us care about the enslaved African Kunta Kinte (Malachi Kirby) (above) and the subsequent generations that finally fulfill his fierce determination that they regain their freedom. It's tempting to say that in finding that freedom, they also restored their human dignity. But the real point of Roots, in many ways, is that they never lost their dignity. While Kunta Kinte was degraded, beaten and humiliated, all parts of the slavery package, that never made him less than what he really was, which was a Mandinka warrior. That point is underscored in the first episode by the older African Fiddler (Forest Whitaker). Fiddler is introduced as a black man who has abandoned himself. He seemingly has submitted to the bidding of Massah John Waller (James Purefoy) in exchange for a tiny shred of autonomy, that is, his shackles aren't physical. After Fiddler is assigned to break Kunta, meaning Fiddler gets the blame if Kunta rebels, Fiddler helps Kunta in a futile escape attempt. Fiddler, it turns out, is from the "tell 'em what they want to hear" school. If you know your real name, he tells Kunta, it doesn't matter what they call you, because "this isn't your home - this is just a place you have to be." The dialogue in Roots is sprinkled with philosophical passages like that, alongside a few lines that might give the viewer pause, like a Mandinka warrior in the mid-18th century saying something will happen "sooner than later." That's small stuff. Roots became a phenomenon almost 40 years ago because the Alex Haley book on which it was based was not a documentary on slavery. It told the slavery story by dramatizing the stories of people who were forced - or, on the other side, delighted - to live under its auspices. The first episode alone contains several extended scenes so brutal they're hard to watch. Their common moral thread is that the perpetrators of this brutality felt no shame. Rather, they declared their actions were necessary and proper to achieve their legitimate interest: getting maximum production out of this slave for whom, or rather for which, they paid good money. Nor does Roots pass over the wide range of non-physical cruelties, like knowing your spouse and child could be sold tomorrow to a plantation several states away and you might never see them again. The beneficiaries of this system are not all painted with the same brush. The cold John Waller has a brother, William (Matthew Goode) (above), who has a streak of sympathy. Just not enough to step in when Kunta's back is whipped into hamburger by a sadistic overseer. That overseer, John Waller and others like them are the easy villains here, and certainly the ones on whom the producers encourage us to focus our outrage. They're nasty pieces of work. As generations roll along and we meet more of them, however, another fact becomes hard to avoid. Slavery, in a way, was a contemporary institution that gave license to a subspecies of mankind that's been around since we developed opposable thumbs: the bully, someone who sneers, taunts and abuses those not in a position to fight back. Today, though slavery has fallen out of fashion, bullying has not, which lends Roots an intriguingly contemporary subtext even as it stays true to its specific narrative mission. 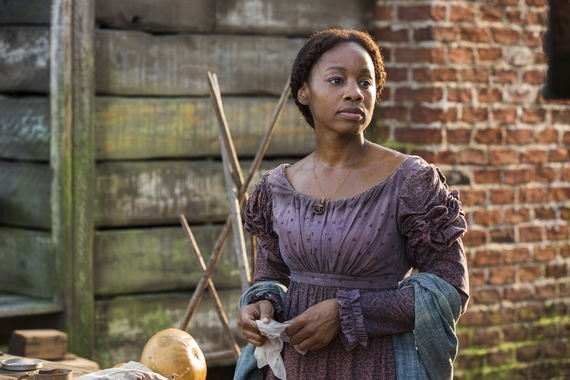 Roots employs a large, skilled cast that includes the likes of Mekhi Phifer, Anika Noni Rose (above), Anna Paquin, TI, Laurence Fishburne and Sedale Threatt Jr. to focuses on a vile institution America permitted for 246 years. It dramatizes the long, winding, uneven path through which the descendants of one determined man finally threw off its shackles. But slavery was a stone that still sends ripples to the wider shores of every American pond, and the fact we thought it was fine for all those centuries says some uncomfortable things about both the people of those times and the human nature that continues right up through today. As for whether the new Roots matches the old one, that's ultimately a minor question. It won't have the same impact, simply because this time we come into knowing the story. But at a time when style too often trumps substance, the new Roots is a solid show about something that matters.